Today I found out the origins of the Jolly Roger flags. Ships throughout history typically stocked a variety of different flags used for sending a message, signaling other ships, and for identifying themselves. For instance, in the 17th and 18th centuries, English privateers were to fly a specific version of the Union Jack, distinguishing themselves from English naval vessels which flew a different version of the Union Jack. Pirate ships were no different, excepting perhaps that they often carried flags for more nefarious reasons like fooling nearby ships into think they were allies until they got close enough that the other ship couldn’t escape. The most famous flags flown by pirates to indicate they were such were all called the “Jolly Roger” and were adorned with a variety of artwork or often no art work at all. Most of these flags were simply black or red with nothing on them. Historical accounts indicate that, should a pirate ship raise a black flag, it indicated that so long as the ship they were attacking surrendered with no resistance, they would be given quarter. Should anyone aboard the ship resist or should the ship try to flee once the black flag was raised, the black flag would be lowered and the red flag would be raised. This flag indicated that no mercy would be shown to anyone aboard the ship that was about to be attacked. Pirate ships were much more feared than other types of enemy vessels because, in resisting other enemy vessels, at any point you could surrender and be offered quarter by the traditional rules of engagement; so you could fight until losing was inevitable, then surrender. With pirate ships though, flying the black flag, you had to surrender immediately if you didn’t think you could win. As pirate ships rarely attacked unless they were in a good position to win, this pretty much meant that, if you encountered a pirate ship, you should probably just surrender right away. As such, flying of any form of the Jolly Roger tended to instill the necessary fear in whatever ship was being attacked that they would surrender immediately. In one extreme example, in 1720, famed pirate Bartholomew Roberts sailed into a harbor at Trepassey, Newfoundland with a black flag flying. This resulted in the crews of all 22 vessels in port panicking and abandoning their ships. Combined, Roberts would have been no match for them, but the necessary fear was invoked from seeing the black flag that they all fled without a fight. Records of pirate ships flying flags that signified they were pirates go back just about as far as history is recorded. Of the Jolly Roger line though, the earliest reference is probably of the skull and crossbones flag used by the Knights Templar, who had the world’s biggest naval fleet in the 13 century and were well known for their pirate-like acts on the sea. When the Knights Templar dissolved, with many members forming the Knights of Malta who were equally known for their piracy, they also were known to fly the skull and crossbones. What’s interesting about this is that the port of Sidon was known historically to be a nest of pirates. Thus, the skull and crossbones, as a pirate flag, probably predates the Knights Templar. In any event, as noted earlier, the skull and crossbones weren’t the only flag to be known as the “Jolly Roger”. Traditionally, any black flag flown, even with no design on it, simply meant the ship flying it was a pirate ship and was offering quarter if the ship about to be attacked would surrender immediately. Any red flag, whether there was a design on it or not, meant the pirate ship would attack and offer no mercy. The earliest references to the name “Jolly Roger” goes back at least to the early 18th century, with one of the earliest documented instances appearing in Charles Johnson’s A General History of the Pyrates (1724). In it, he references that two pirates from the early 18th century, Bartholomew Roberts and Francis Spriggs, had named their individual flags “Jolly Roger”. These flags were quite different in appearance, so historians think that this generic name for pirate flags of all varieties was already well established. The origin of the “Jolly Roger” name itself is thought to stem from one of the following three things. First, that it is simply adapted from the English word “roger”, which basically just means “wandering vagabond”; indeed, another name for the Devil among the English at this time was “Old Roger” and putting a depiction of the Devil on these flags was quite common. Another possibility comes from the 17th century French “jolie rouge”, which meant “pretty red” and, thus, was what the red flags were called. 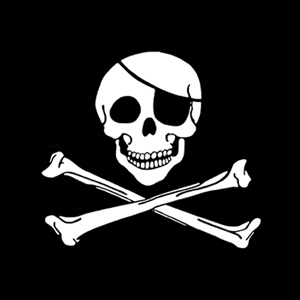 Accounts as early as the 18th century also have the black versions of these flags being called the “Jolly Roger”. So if “Jolly Roger” stems from this, sometime between the 17th and 18th centuries the meaning was expanded to mean all pirate flags, regardless of color. An alternative theory comes from the fact that certain Asian pirates called their captains by the title “Ali Raja”, meaning “King of the Sea”. It’s possible that this term was then adapted by the English for eventual usage as the name of their pirate flags. Personally, I think the first theory stands up to Occam’s razor the best, being the simplest solution that also, indecently, makes a lot of sense. The Skull and Crossbones in Unicode is U+2620. The tradition to use the Jolly Rodger on submarines stems from 1901 when Admiral Sir Arthur Wilson VC said submarines were “underhand, unfair, and damned un-English. … treat all submarines as pirates in wartime … and hang all crews.” Upon learning of this, Lieutenant Commander Max Horton, who later became an Admiral, raised the Jolly Rodger when his submarine was returning to port after sinking the German ships SMS Hela and the destroyer SMS S-116. Thus, the tradition was born that on the completion of a successful mission, the returning submarine should fly the Jolly Roger. This eventually spread into the Jolly Roger being the official emblem of the Royal Navy Submarine Service. Spanish tombs and graveyard entrances at one time were traditionally marked with real skulls and crossbones and today are often marked with carved skull and crossbone signs. A notorious “secret” society at Yale goes by the name of Skull and Bones. The alumni organization that owns the property and oversees the organization is official called the Russell Trust Association, named after General William Huntington Russell who was one of the cofounders of the association, along with Alphonso Taft in 1832. Former members of this association include President George H. W. Bush, Goerge W. Bush, John Kerry, President William Howard Taft, Supreme Court Justice Potter Stewart, Secretary of Defense Robert A. Lovett, Senator David L. Boren, Obama’s economic adviser Austan Goolsbee, and many other highly placed and successful individuals. Many conspiracy theorists view the society as somehow evil and attempting to establish some new world order where its members rule everything; they often cite the fact that so many known Bones alumni go on to be incredibly successful to show the conspiracy. However, if they were really trying to establish some new world order, you’d think they’d open other chapters at other Universities around the world as 5-15 new members a year isn’t going to cut it for taking over the world. Also, it should be expected that the Bones alumni would go on to be incredibly successful due to the fact that the society typically only selects a handful of members per year from elite students at Yale. In light of that, it would be shocking if known members didn’t go on to high levels of success in their chosen fields. Pirates typically wore things like scarves, bandannas, hats, etc. to ward off the sun. It is also theorized, though not known for sure, that they wore eye patches to keep one eye adjusted to light levels inside, while the other was adjusted to the extreme brightness often experienced outside at sea. This way, if they had to run below deck, they could remove the eye patch and be able to see out of that eye instantly. Whereas without the patch, they’d need to wait a while before they’d be able to see well. Pirates and other sea-fairing folk also tended to wear tight clothing so that it wouldn’t catch on ropes or get jammed in pulleys and things of this nature. The stereotype that pirates often had peg legs or hooks instead of hands comes from the fact that the typical method of repairing a badly damaged appendage used to be to simply saw it off as quick as possible (often literally with a hand saw and no pain killer), before it became infected, and then cauterize the wound. Given the pirates lifestyle, these such injuries weren’t terribly uncommon. However, as you might expect, having a peg leg, on a ship that is being tossed about by the ocean, isn’t a recipe for keeping your balance, so it is unlikely there were many peg-legged pirates. Further, winching lines and the like wouldn’t be very easy with one hand that was a hook. So once these sorts of injuries happened, unless the injured was a cook or the captain or the like, it’s unlikely they were allowed to continue serving. The classic “arrrrr” noise that accompanies pirate-speak in the movies probably has its origins in the 1950s version of Treasure Island. Actor Robert Newton played the particularly memorable pirate character Silver; he later popularly reprised the role in sequels and on TV. His accent on the films featured a very strong rolling of the R’s, which is thought to be how “arrrrr” worked its way into pirate-speak. Most of the rest of pirate-speak, like “avast”, are simply just old nautical terms used by all seaman, not just pirates. Why are pirates depicted with a parrot on their shoulder? Why was the pirate flag called the Jolly Roger? =) I really enjoyed your article! Thank you. Interesting that 3 probable sources for jolly roger came into play. Good useful trivia but could have been a hell of lot better if you didn’t bury the lead — next time put paragraphs 9 thru 11 at the top. Thanks. Skull and bones goes back 20,000 years. I suggest you join yorkrite freemasonry. Many flew it as crusaders for humanity such as the knights templars of which many of the pirates were.Fleeing the persecution of the vatican,states and royals. It has a specific meaning that flag and is a reminder to all who gaze upon it.